I’ve got it! 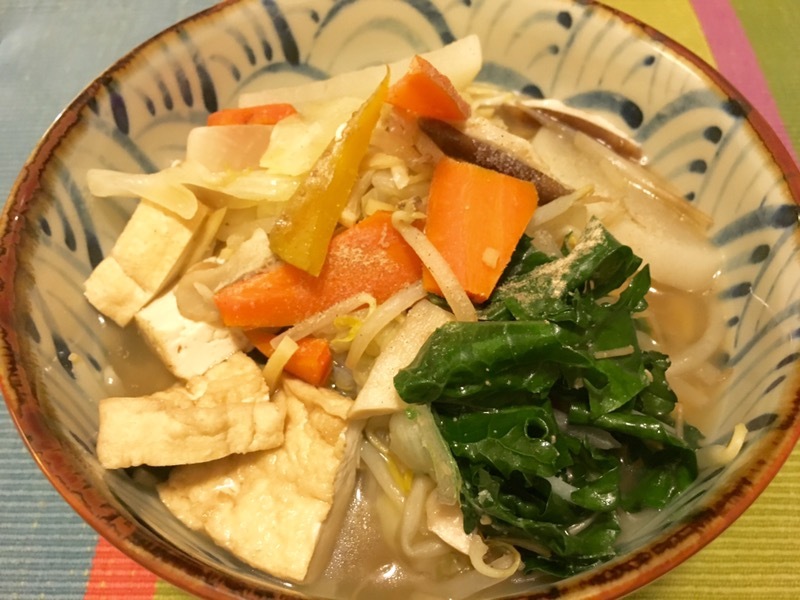 An authentic Japanese miso ramen broth made 100% plant-based! It wasn’t difficult at all. 3~4 cloves garlic – sliced. In a separate saucepan, boil water for the noodles, but before cooking the noodles, blanch kale and mungBeanSprouts, and set them aside. Serve in the Asian noodle soup bowl, whitePepper to taste, garnish with green onions if you like. Here’s what I’ve done a few nights ago, using daikon, atsuÂgé (deepfried Tofu) & kale instead of onion & bokChoy, & no added oil to start. In a medium sauce pan, add water, daikon, garlic, ginger, shiitake, & atsuÂgé. Bring to boil, then simmer. Add soup stock, ground sesameSeeds, nutritionalYeast, and miso. As the broth is nearly ready, boil the noodles in another pot. Add mungBeanSprouts and kale to the broth a minute before it’s ready. WhitePepper to taste. Serve and enjoy eating! I inadvertently simplified the first recipe. Both very satisfying. Hope you try it. Thanks for checking then out!